Lonnie Wheatley, WICHITA, Kan. (August 18, 2018) – Once again, the USAC Southwest Sprint Cars “Freedom Tour” finale at 81 Speedway left a near-capacity crowd standing on its feet and roaring approval. 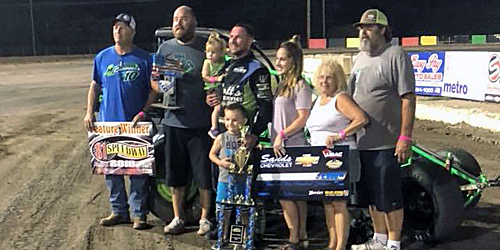 This time, the raucous crowd was cheering on hometown ace Jeremy Campbell as he outdueled Arizona’s Charles Davis, Jr., for the $2,500 winner’s share in Saturday night’s final 30-lapper of the Sixth Annual “Freedom Tour”. It proved to be a monumental battle with Campbell ultimately capturing the lead for keeps on the 22nd round and then fending off Davis, Jr., over the closing circuits to secure the win aboard the Dan’s Cycle No. 10c Sprint Car. After a dramatic last-corner pass of Chris Bonneau to win the night’s second qualifying race, Campbell gridded the feature field outside the front row with Friday night winner Davis, Jr., leading the way to the green flag from the pole position. Campbell gunned into the lead at the outset and worked the high side of the track to open up a 2.5-second advantage in the early rounds. But, when traffic came into play after eight rounds, Davis, Jr., chomped away at the advantage in short order before sliding into the lead on the 11th circuit. The pair battled for the point through traffic until the first of just two cautions flew after 20 laps with Campbell shooting back out front on a lap 22 restart after the second caution appeared just one circuit later. While Campbell set the pace on the cushion in the closing rounds, Davis, Jr., tracked his every move and was poised for the late slider until tripping over the turn one cushion on the 28th lap and losing several car-lengths. Campbell was flawless over the final two laps to finish off the landmark win, doing several celebratory donuts that brought the crowd to a roar as Davis, Jr., fell short of an 81 Speedway sweep with the runner-up finish. While Davis, Jr., and Campbell raced to a near half-lap advantage over the rest of the field in the opening 20 laps of non-stop action, the battle for third through tenth was torrid throughout. Racing in seventh when the first caution appeared, Sapulpa, Oklahoma’s Kyle Clark sliced his way up to third over the closing rounds to round out the podium after starting 12th. Nebraska’s T.J. Artz picked off several positions over the final rounds as well to snare fourth with Arizona’s Dennis Gile rounding out the top five after an eventful set of final laps that shuffled the running order significantly. Davis, Jr., and Martin topped Saturday night’s heat race action with Davis, Jr., rallying from sixth to first on the opening lap to win the second qualifier before Campbell’s last-lap dramatics in the second qualifier. Heat One (8 Laps): 1. 50-Charles Davis, Jr. (2), 2. 7-Michelle Decker (4), 3. 18-Terry Richards (1), 4. 13-Dennis Gile (8), 5. 15-Chris Bonneau (7), 6. 98-Matt Lundy (5), 7. 98az-Daylin Perreira (3), 8. 9$-Kyle Clark (6). Heat Two (8 Laps): 1. 16-Mike Martin (1), 2. 5-Cameron Hagin (2), 3. 10c-Jeremy Campbell (4), 4. 5$-Danny Smith (3), 5. 17-Mike Woodruff (5), 6. 57-T.J. Artz (7), 7. 5x-Tyson Hall (6). 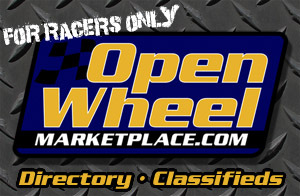 Qualifier One (8 Laps): 1. 50-Charles Davis, Jr. (6), 2. 18-Terry Richards (3), 3. 5$-Danny Smith (2), 4. 5-Cameron Hagin (4), 5. 16-Mike Martin (5), 6. 57-T.J. Artz (1), 7. 9$-Kyle Clark (8), 8. 5x-Tyson Hall (7). Qualifier Two (8 Laps): 1. 10c-Jeremy Campbell (4), 2. 15-Chris Bonneau (3), 3. 13-Dennis Gile (5), 4. 7-Michelle Decker (6), 5. 98-Matt Lundy (1), 6. 98az-Daylin Perreira (7), 7. 17-Mike Woodruff (2). “A” Feature (30 Laps): 1. 10c-Jeremy Campbell (2), 2. 50-Charles Davis, Jr. (1), 3. 9$-Kyle Clark (12), 4. 57-T.J. Artz (11), 5. 13-Dennis Gile (3), 6. 5-Cameron Hagin (6), 7. 7-Michelle Decker (4), 8. 16-Mike Martin (7), 9. 5$-Danny Smith (8), 10. 15-Chris Bonneau (5), 11. 18-Terry Richards (9), 12. 98-Matt Lundy (10), 13. 98az-Daylin Perreira (13), 14. 5x-Tyson Hall (14), 15. 17-Mike Woodruff (DNS). Lap Leaders: Jeremy Campbell 1-10, Charles Davis, Jr. 11-21, Campbell 22-30.